It Is Time To Enjoy Bicycle Indoor And Outdoor. This Mini Exercise Bike Makes The Bicycle Easier. The Frame And Feet Is Stable So You Don't Need To Worry About The Quality. And You Can Enjoy Biking While You Are Watching TV Or Have A Talk With Others. The data show on the LCD display is clear. The Pedal Exercise Is Fit For Users Of All Ages. It Is Beneficial For Building Up Your Body. Multifunctional LCD monitor displays time, distance, count，total count，calorie and scan. 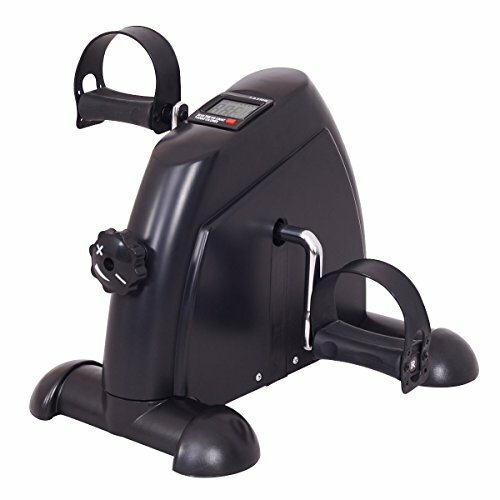 Pedal Size: 4" x 4"
【Multi-Purpose】It can be used when you are sitting on a chair in your office or watching TV, this pedal exerciser will help you to exercise in a lazy but efficient way. 【Portable and safe】Item is easy to transport, its low-impact workout is perfect for recovering from injury. 【Durable Construction】This pedal exerciser is made from heavy duty iron frame with anti-slide and anti-scuff designed pedals. It ensures long-term durability and brings you a superb exercising experience. 【Adjustable Tension and Pedals' Tightness】Resistance can be easily adjusted with the tension screw to meet your personal needs. Also, tightness of pedals can be adjusted a little to help you doing exercise in a more comfirtable way. 【Digital LCD Display】Multifunctional LCD monitor displays time, distance, count, total count, calorie and scan.